Many years ago, the Ancient Egyptians designed the pyramids as the burial monuments of pharaohs, who needed to rest the way they lived their lives; as kings. Mexican architect Juan Carlos Ramos thought that a royal accommodation shouldn’t be denied while still living, and designed Pyramid House, as his proposal for a recent architecture competition. It’s minimal design and clean aesthetic create a sense of serenity and stillness, while its details and interior design are the epitome of modernity and simplicity. Through its huge window on one of its sides, one can see the interior of the house, while multiple window cuts on the other sides of the pyramid, allow natural light to fill the entire house. The Pyramid House is a multi-level building that includes a library, two bedrooms, a pool and even a recording studio, all designed to fit cleverly inside this unconventional structure. 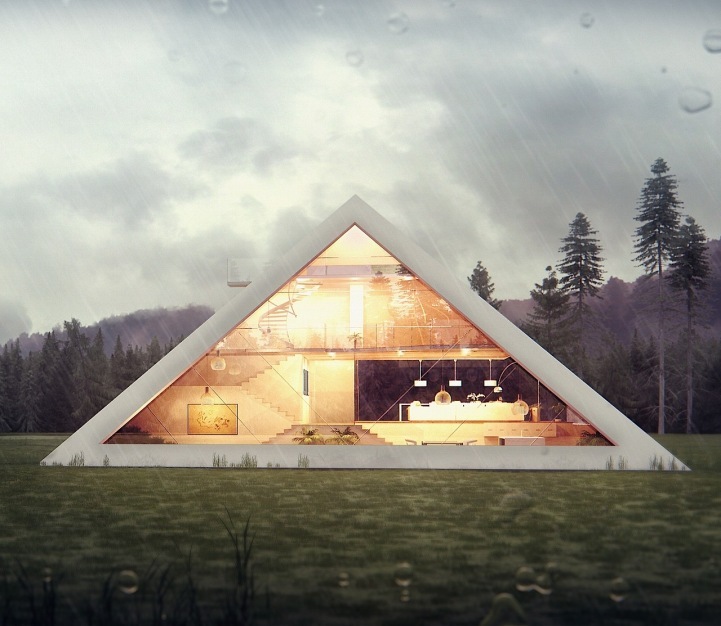 The Pyramid House features glass walls that offer exceptional views of the surrounding landscape and allow natural light to penetrate its deepest corners. The openings vary from narrow slits to large glass planes and alternate in a way that gives the building a dynamic appearance that contrasts the static look of the geometry. Distributed across several levels of the pyramidal volume are two bedrooms, a library, kitchen, bathrooms, garage and even a recording studio. A cantilevered balcony is situated near the top of the building between the bathroom and library. Ramos used 3D rendering software to create photo-realistic renderings that would bring the iconic shape to life. Switching back and forth between 3Ds Max, Photoshop, Itoo, Forest and many more programs, the architect designed a private house that demonstrates simple geometric shapes can be deployed in residential architecture. The house brings examples such as BIG’s cascading towers and steep roofs into the realm of single-family housing and promises to open up a whole new chapter in designing private homes.